TOP > How to Guides > What's MountRec? MountRec is Mountaineering Log Sharing Service. MountRec was born from "Yamareco" which is the mountaineering log sharing service in Japan. The original system was developed to share mountaineering logs of mountaineering club "Kamonokai". We offer the system for free in order to share the trekking information easily. Easy to Register Route by Clicking on the Map! or upload GPS Log! You can see how long does it take from the graph. Check & print route on topographic map! 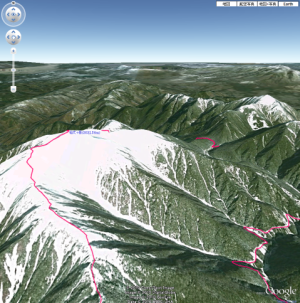 View 3D route with Google Earth on your browsers! There are some functions for Groups like mountaineering club or friends! - Private setting for Notes and Photos "open to group members"
To make your log, please Sign up first!